As mentioned before, we were rained on all the way to Cobán, which was a shame because the roads from Flores to Coban were amazing. We were still wet from the previous day as we suited up again and prepared for a rainy day all the way from Cobán to Antigua. The day started foggy and cold. There was a running race going on in Cobán as we rode out of town we waved at runners of all ages struggling up the hills. Off into the mist and then sprinkling, I pulled up my soaked coat and gripped my handle bars readying myself for a long rainy day. What had been dense green jungle the day before slowly gave way to pine crested mountains that reminded me of Alex and my earlier rides in the bay area, I almost expected to see Alice’s Restaurant around the next corner. We climbed and climbed the mountains, and as we crested the top the sun poked through the clouds. We didn’t get rained on at all that day, and our suits were almost dry by the time we got to Antigua. The only hitch in the day of riding was taking the long way and getting somewhat lost in Guatemala City. The short story on that is that a bus helper (in Latin America most buses have a driver and a helper who shouts out where the bus goes and collects the money as people get on) overheard us asking for directions and had us follow him till we got to the correct road and then we were off to Antigua. In a valley surrounded by volcanoes lies a sleepy cobble stone strewed town full of colorful buildings and friendly people. Antigua has that hipster vibe one gets in San Francisco or Portland and backs it up with its artisanal coffee roasters, bike co-ops, and immersion language schools. 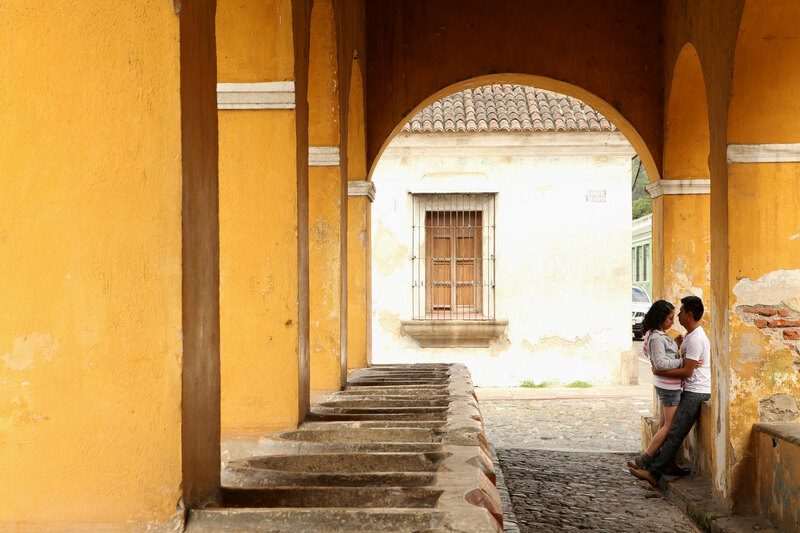 Though there is a plethora of tourists that flock to this city, their presence doesn’t feel as oppressive as in Oaxaca, and wandering the streets one can still get a feeling for its inhabitants. Antigua is surrounded by agriculture land that produces everything from coffee and cocoa to macadamia nuts. On a tour of the R. Dalton coffee farm we learned that to be able to get arabica plants to grow in the volcanic soil of Guatemala they have to graft the roots of the robusta plant onto them when they are two to three months old. Only this root system can withstand the soil and the bugs that live in it. 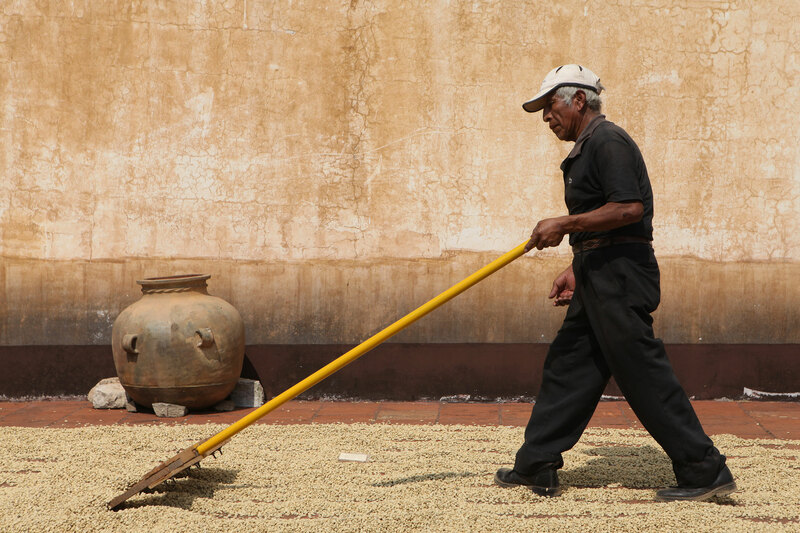 The coffee is picked, processed, and even roasted (when it isn’t being shipped raw) on site. The head of the wet mill, who decides when coffee is ready to move from water tanks to the drying floors (a costly mistake if he is wrong) has been working there for 45 years. Watching him work the beans on the drying floor, checking the water density of the husks, you saw an expert working in his element. One of the other experiences worth mentioning was today, even though we weren’t in a home kitchen making Thanksgiving dinner, we did make it to a kitchen, to make chocolate. There is a museum of chocolate here, and we took a class to learn the history of chocolate and how it is made. The class was informative, and we made traditional Mayan drinking chocolate (spicy and slightly sweet), European Hot Chocolate (with milk and cardamom), and our own chocolate candies. Good option if you have kids or just a couple free hours in the city. Great post, hope your Thanksgiving was not only memorable but happy also. Your info help one appreciate even more great coffee and chocolate. The cardamon sounds interesting, I have used it as one of many ingredients in my curried hog dog sausage, however cardamon is incredibly expensive here. Thanks again for the great and informative updates. Be well, safe and continue to enjoy your amazing journey. So cool that you got to make chocolate! Sounds like a great place to visit and you had a nice Thanksgiving. We missed you up at Grandma and Grandpa’s! Be safe!